Every year, the National Academy of Medicine awards the David Rall Medal to an NAM member who has demonstrated distinguished leadership as chair of a study committee or other such activity, showing commitment above and beyond the usual responsibilities of the position. 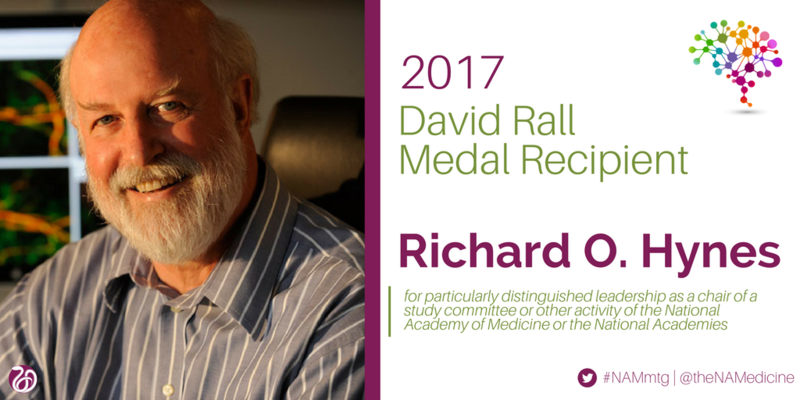 The 2017 David Rall Medal was awarded to Richard O. Hynes, Investigator at the Howard Hughes Medical Institute and Daniel K. Ludwig Professor for Cancer Research at the Massachusetts Institute of Technology. In the interview that follows, Dr. Hynes discusses his chairmanship of the NAM/NAS Committee on Human Gene Editing and how we can better engage the public on critical issues in science and medicine. How did you get your start in molecular and cellular biology? I’ve had an interest in biology my entire life. My father was a biologist and he would always give me things to explore. In the UK, you concentrate on a subject early in your education so I concentrated on science and never lost my interest. Later in my education, I concentrated on biochemistry. I was very lucky throughout my education. I’ve been able to learn from some of the brightest minds in the field. It’s been a fantastic time to be a scientist. I’ve always been interested in how cells interact with each other and their environment. We are all multicellular organisms and individual cells don’t just do things by themselves—they interact with one another. I’ve been interested in cellular interactions in multiple contexts my whole career. How do cells know where to go? Why do they stay put or why do they move? How do white blood cells know where to stick and why do they sometimes stick in the wrong places and give you inflammation? Why do blood platelets stop you from bleeding but sometimes give you blood clots? The balance between appropriate and inappropriate adhesions has been something I’ve worked on with others for most of my career. Now we work on this mostly in the context of cancer. Why do cells go to the wrong places? Why do they wander when they should stay put? Why do they sometimes stop and give you a metastasis? You’ve also done some policy work throughout your career. Have you always had an interest in the policy side of science? It’s my feeling that scientists need to reach out to the public and to government. Back in the 1990s, I was President of the American Society of Cell Biology and I got involved with their outreach activities. In the mid-2000s, I chaired another National Academies committee on stem cells and it was absolutely fascinating. At the time, a lot of people were trying to ban stem cell research and the National Academies set up their own committee to explore the issue further. It’s critical to engage the public on these issues and scientists need to be involved in that process. You recently co-chaired our report on human genome editing, which has received a lot of national and international attention. Why is there so much interest in this topic now? Recent advances in the capability to engineer genomes has furthered our ability to understand development, biology, and disease. The potential for this technology is enormous. It is already being very effectively applied in laboratory research and is beginning to be applied in clinical settings. On the other hand, like many medical technologies, genome editing technology has to be handled appropriately and it should be used under appropriate oversight. Genome editing isn’t brand new. It has already been applied in non-heritable diseases. If someone has a genetic disease like sickle cell anemia, then you could in principle edit the genome of blood cells in that particular patient to fix the disease and those alterations would not be passed down to their children. While a lot of technical issues need to be resolved before we could make heritable changes in genes (alterations that would be passed down from generation to generation), one can assume that this will become feasible in the not-so-distant future. This is controversial because some people think science should not interfere at all with genetic inheritance while others think that if we have the ability to fix some genetically inherited diseases, we should. Genome editing will have enormous societal impact and the implications of this technology need to be considered early on. The public needs to be engaged in thinking about the societal and ethical issues around new scientific and technological advances. It’s going to be several more years before we have the ability to edit genes that could be passed on to the next generation. We need to use that time to think about how to regulate the uses of this technology and decide what should or should not be allowed. The National Academies’ report was written in part to foster that thinking process. 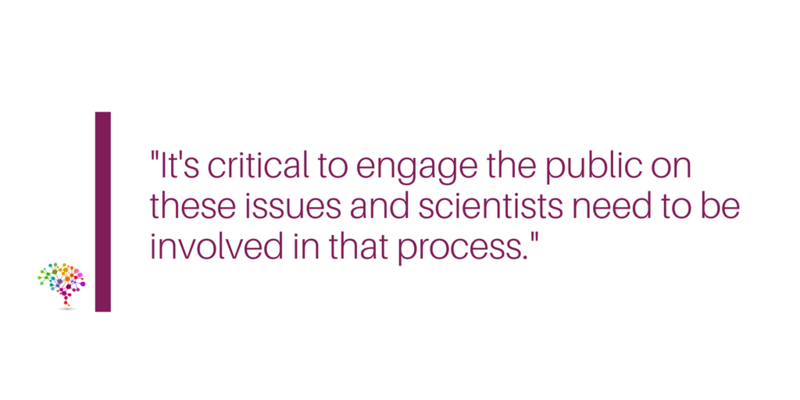 Do you think the science community is doing enough to engage the public? I don’t think we’re doing enough. It’s not easy to do but we need to do it better. We need to make an effort to make science accessible to the public and make it clear that they can understand science even if they aren’t scientists. Some people feel insecure about understanding science. They shouldn’t. Scientists and the media need to make a better effort to make science understandable for everyone. We also need to better engage the public in making hard decisions around the ethics of new technologies like genome editing. Policy makers and scientists must incorporate input from the public when making these decisions. We need to find out what people think and inquire about their level of concern. There are religious issues as well that need to be taken into account. We need to know what concerns people and then set up good regulatory systems that address those concerns. It seems that now, more than ever, the public is experiencing distrust in science. How do we better cultivate public trust? It’s true that the public has distrust in science and that’s worrying. That’s part of why we need to do a better job of communication. I don’t understand why people reject science. It seems to me that we’re slipping backwards which means we need to work harder in education and communication with the public. Scientists have an obligation to educate the public. The government supports a lot of scientific research. That’s not a right—that’s a privilege. Scientists should continually make the case as to why science is good for people and for society. Any advice for future committee chairs? Get a great committee. We were very lucky and had a wonderful committee with very diverse expertise and international representation. I was also particularly fortunate to have a great co-chair, Alta Charo. The people really matter. Why do you volunteer with the National Academies? The National Academies explore very important societal issues. The scientific community has an obligation to give informed advice on these issues and to listen to others. It’s imperative to think about these issues at the intersection of science, medicine, policy, and society. The National Academies provide a venue to do so in which all recommendations are rooted in hard evidence. What advice would you give to young scientists who are just starting out in their careers? You have to love it. It should be a passion. It’s hard work and it’s frustrating at times. You’re working at the edge of the unknown so experiments go wrong a lot. You need to be passionately interested in discovery and in the application of science to do a lot of good for society. What is the most important issue in health or science right now? Neuroscience is the next great frontier in biological science. If I were just starting out, I’d probably focus on neuroscience. The combination of engineering and biology is also increasingly strong. The ability to manipulate cells and do genetic engineering is very powerful and will continue to be so. The problem with science and medicine is not on the application side. It’s the delivery side. America has some of the best hospitals in the world but we don’t deliver the best health care and it still costs us much more than anyone else. The system is not working well and health inequities continue to be exacerbated by this. What does it mean for you to be an NAM member? It’s a great honor. The National Academy of Medicine gives members an opportunity to impact the nation and to learn from some of the most brilliant people. I always want to keep learning and the National Academies’ provide a tremendous opportunity to do so. The David Rall Medal is awarded to a member of the National Academy of Medicine who has demonstrated particularly distinguished leadership as a chair of a study committee or other such activities in a manner that was particularly exemplary, demonstrating a commitment substantially above and beyond the usual expectations of a committee chair. To view past winners of this award, please click here.